The essence of marriage is companionship and mutual trust. It is a societal norm to get married. However when it comes to the girl child it becomes the sole mission of the parents right from her birth. Some Parents would like to get rid off her as quickly as possible. In the process they ignore the other dimensions – physical and psychological – which will have a negative emotional impact on the girl who gets married at an early age. The Prohibition of Child Marriage Act 2006 stipulates that the minimum age for marriage for a girl is 18 years and that for a boy is 21 years. Having a law is one thing and ensuring its effective enforcement is another thing. Sometimes we see that the people responsible for enacting law themselves promoting child marriages due to various compulsions which betrays their sincerity to the cause. Every one considers that it is the privilege of the parents to decide when to get their daughters married and if they chose to do so even before the girl attain 18 years of age, it is their choice and there is nothing we can do about it. The reasons could be for security, economic stability, family compulsions from grand parents, further delay may result in losing the groom to someone else (this happens mostly in consangual marriages), etc. Every Day 25,000 Child Marriages take place in the world. In the Next Decade about 100 million Girls will be married before they reach 18. More than 51 million girls between the ages of 15 to 19 are currently married. India stands at 9th position in the world with 57% of girls getting married before the age of 18 years. Niger (82%), Bangladesh (75%) and Chad (73%) are the top three. The other Asian nation to figure in this dubious distinction list is Nepal with 63% placed at 6th position. (Demographic Health Survey 1996-2001). If we look at the Indian scenario, Andhra Pradesh is 3rd in India along with Rajasthan with 55% of marriages being child marriages (NFHS – 2005-06). Andhra Pradesh is first in respect of child marriages in South India, with 49%, followed by Karnataka with 29.6%, Tamilnadu 19.5% and Kerala 11.8%. Andhra Pradesh also accounts for the least Age at Marriage as 12 years, which is the lowest in entire India. The prevalence of child marriages is quite rampant in Warangal district. Warangal district, situated 130 km from the state capital Hyderabad is bounded on the North by Karimnagar district, on the West by Medak district, on the South by Nalgonda District and Khammam District on East and South – East. The Geographical area of the District is 12846 square km (7993 square miles). Warangal is a vast district with 52 revenue blocks, known as Mandals. The total rural population of the district is a little over two and half million (26.23 lakhs). There are five towns in the district viz., Warangal, Kadipikonda, Janagoan, Mahubabad and Dornakal. The total urban population is over half a million (6.2 lakhs), making the total population of the district a little over three million. The population density of the district is 406 persons per square mile. While Warangal has a rich history and currently boasts of excellence, academia, and has seen significant agricultural and economic development, the district is a contradiction in terms, and is characterized by dwindling gender indices, increasing marginalization, exclusion, and exploitation of women and children, especially from the socially and economically disadvantaged groups, and poor access to services for the socially marginalized communities. The percentage of literacy in the district is 49.26% and only 19.16% of the female population of the district is literate. In terms of employment, girls and women, who form a significant part of the agricultural and non-agricultural labor force, fare even worse than men, with lower wages, unhygienic and unsafe working conditions, and reported abuse and exploitation at the worksite. About 1500 child marriages, mostly of girl children take place every year in Warangal. A study conducted by Tharuni voluntary organization working in the district indicates that more than 66% of the girls get married before the age of 19 years, some even at the age of 12. A door-to-door survey by this organization in 10 villages revealed an astonishing 102 cases of child marriage. Incidences of girls dying during delivery due to complications, childlessness, and harassment for dowry, stillbirth and low birth weight, child widows, prevalence of sexually transmitted infections are seen commonly among couples here. Child Marriages are most prevalent in the District of Warangal. It is evident from the following Census 2001 Data that in Warangal about 40.2% marriages among the girls of 15-19 years age group are child marriages. Warangal stands in Second position in the State of Andhra Pradesh in Child Marriages among 15 to 19 years age group Girls and Third among 10 to 14 years Girls with 2.26%. CHILD MARRIAGES DATA IN THE DISTRICTS OF A. P.
Tharuni is a voluntary organization working for the empowerment of Adolescent Girls, Women and the Aged. As a part of our endeavor to sensitize and educate Adolescent girls regarding various issues such as Reproductive health, nutrition, personality development, etc we have organized 40 workshops in 16 Government Girls High schools in Warangal, Hanamkonda, Kazipet and Wardhannapet mandal and imparted training to more than 1500 girls studying in the classes 6th to 10th in the past two years. During our interaction with the students we have observed that the drop out rate among the girls is quite alarming at 7th and 8th class levels and in most of the cases (80%), it was due to child marriages. Some of the Headmasters have reported that they receive at least 4 to 5 wedding invitations every year from their girl students. Tharunihasidentified that the age old problem of child marriages still persists in this hi-tech era and is the main cause for the high frequency of dropping out of girl children in higher classes. There is a need to enlighten both the girls as well as their parents regarding the adverse impact on the health of the girl due to early marriages and the resultant problems in family. Hence Tharuni started a Campaign against child marriages and its preliminary surveys showed that at least 1200 child marriages take place in one year in the district of Warangal alone. Tharuni organized Kishora Balika Melas for Adolescent Girls with the theme that in this 21st century, a girl’s marriage should be performed only after she attains 21 years of age to bring awareness among them about the evil effects of child marriages. To enlighten the parents on this issue of Child Marriages, Tharuni went round 81 problematic Villages of Warangal district covering 22 Mandals. Tharuni organized meetings and Kalajathas (cultural events) which created a very good impact. As many as 40 child marriages were stopped in three months in the year 2003 with the help of police/ICDS/teachers and other Government functionaries and many more curtailed in the negotiation stage itself. It was in this context that Tharuni was chosen by the National Commission for Women, New Delhi to be associated with the statewide weeklong campaign against child marriages in Andhra Pradesh and was entrusted with the task in Warangal district. Tharuni also organized training program on HIV/AIDS for out of school Adolescent Girls in three Mandals of Warangal district. During this program, Tharuni realized that adolescents are more vulnerable to such diseases like HIV/AIDS (one reason being child marriages) and they need lot of counseling and support. Tharuni organized a UNICEF pilot project on HIV/AIDS for Self Help Group women, Adolescent Girls and Youth in 200 villages in Warangal District covering 90,000 people. The NACO and UNAIDS reports show that 50% of new infections occur among youth under the age group of 15 to 24 years. The risk of HIV/AIDS increases with child marriages. With the collaboration of Andhra Mahila Sabha literacy house Tharuni produced a puppet show “Bommala Pelli” (marriage of dolls) and an intensive drive against child marriages was launched in 40 villages where this practice is prevalent. The shows were highly successful in generating awareness in the villagers about the issue. Recognizing the power of film media in influencing the society, Tharuni Conceptualized and produced a documentary film Chigurutakulu (Tender Leaves) on the problem of child marriages in Warangal district with the help of Chandana Art Creations, Hyderabad. A two day Regional Workshop on “Combating Child Marriages” was organized by Tharuni at Warangal on 14th and 15th June 2004.About 180 stakeholders belonging to youth, parents, caste leaders, political leaders, Govt. officials, NGOs, legal experts and media actively participated in the workshop. Thirty NGOs from five Telengana Districts participated in the workshop. Tharuni filled a case in National Human Resource Commission (NHRC) in 2005 giving the 60 instances of child marriages to be held within two months and could bring pressure on the State Government to stop these marriages. The case is still pending and Government could only stop 8 child marriages. BBC (British Broadcasting Corporation), U.K. in 2006 recorded a short story of a child marriage victim Ms Jangri, who was given shelter by Tharuni and transformed her into a child campaigner against child marriages. Tharuni could bring 30% change in the occurrence of child marriages in Mandals where it has been working. That is the only reason why State Government identified Tharuni as the only Voluntary Organization to Frame the Rules for the new Prohibition of Child Marriage Act 2006. The New Act gives us more power to take action against the people who are encouraging Child Marriages with the weapon of severe punishment of two years and one Lakh penalty and appointment of Child Marriage Prevention Officers. Any Agency or individual can stop the child marriage by filling a Writ in the court. For the first time in Legal history, this Act gives relief to Child Marriage girl victims by in providing shelter to children born and maintenance to the girls until they marry again. Tharuni stopped many Child Marriages in the past twelve years. Every marriage season is crucial for Tharuni. Tharuni filled about 53 cases against parents, elders and purohiths who performed child marriages in the District of Warangal under PCMA 2006. In the villages where ever cases were filled, people have stopped performing child marriages. But Hundreds of such marriages were stopped only through counselling. In few cases, Tharuni failed to stop the marriage, but could counsel the parents to continue the studies of their girls after the marriage. Tharuni has been working for the empowerment of Adolescent girls, Women and the Aged in the district of Warangal since four years. Tharuni also works for eradicating social evils like Child Marriages, Child Labour, Human Trafficking and HIV/AIDS. Tharuni organizes Kishora Balika Melas for Adolescent Girls every year to bring awareness among them about the evil effects of Child Marriages. To enlighten the parents on this issue of Child Marriages, Tharuni with the financial assistance from the District Administration went round 81 problematic villages of Warangal District spread over 22 Mandals. Tharuni organized meetings and Kalajathas (Street Theatre & Puppet Shows) in these villages which created a very good impact. As many as 30 child marriages were stopped in the first 3 months of campaign itself and many more curtailed in the negotiation stage itself. In the last Twelve years, Tharuni could stop hundreds of Child Marriages. According to a study by District Women & Child Welfare Department, Tharuni could bring 30% change in the status of Child Marriages in the area where Tharuni is working. Tharuni organized Mandal level Sensitization workshops for all Government and Political functionaries in four problematic Mandals in Warangal District under UNICEF supported Child Protection Project. With the collaboration of Andhra Mahila Sabha puppetry house Tharuni produced a puppet show “Bommala Pelli” (Marriage of Dolls) and an intensive drive against child marriages was launched in 40 villages where this practice is prevalent. The shows were highly successful in generating awareness in the villagers. Tharuni conceptualized and produced a documentary film – “Blooming Buds” on the problem of child marriages in Warangal district with the help of Chandana Art Creations, Hyderabad. Tharuni adopted problematic Mandals and started Balika Sanghams to promote Education and skill training for Adolescent Girls in order to abstain from marrying early. In four Mandals viz., Dharmasagar, Geesukonda, Devaruppula and Station Ghanpur, about 500 Balika Sanghams were established. 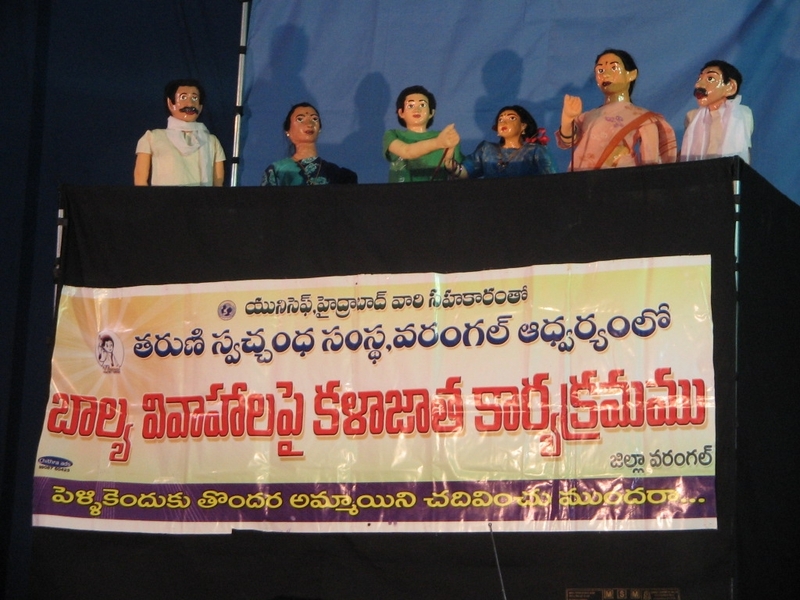 A puppet show called “Malli’” has been produced with the help of UNICEF, Hyderabad and shows were organized in all the villages in three Mandals. An Exhibition was organized in all the High schools and Upper Primary Schools narrating the Problems of Child Marriages and the Acts prohibiting it. Later an Essay Writing Competition was held for the girl students and prizes were distributed. The 26 Flexi chart exhibition produced by Kadalika in collaboration with UNICEF generated awareness among the students and teachers. Tharuni filed a Public Interest Litigation in NHRC in 2005 challenging the Government to stop 60 Child Marriages in the District of Warangal. But, they could stop only 8 marriages. NHRC along with National Commission for Women could pressurize the Government to bring changes in the Law and hence, came a new Law – Prohibition of Child Marriages Act 2006. Tharuni was part of Parliamentary Committee when this new enactment was made. Tharuni’s suggestions were adopted by the Committee. Tharuni was also part of State level Committee to prepare Rules for PCMA – 2006. Tharuni filled many cases against erring elders in various courts – from NHRC to regular Magistrate Court. Tharuni filled cases in the court of District Legal Services Authority, State Human Rights Commission, District Magistrate Courts in Warangal. A total of 53 cases were registered under Prohibition of Child Marriage Act 2006 and could save many girls from the evils of Child Marriages in the District of Warangal.